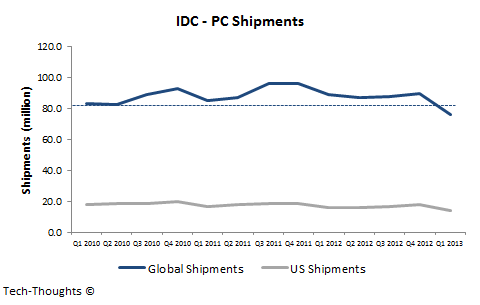 IDC has just released their PC shipment estimates for Q1 2013, and the numbers don't look pretty for Microsoft and the PC industry. PC shipments posted their largest YoY decline in history, reaching their lowest level since early 2009. At this point, unfortunately, it seems clear that the Windows 8 launch not only failed to provide a positive boost to the PC market, but appears to have slowed the market. While some consumers appreciate the new form factors and touch capabilities of Windows 8, the radical changes to the UI, removal of the familiar Start button, and the costs associated with touch have made PCs a less attractive alternative to dedicated tablets and other competitive devices. Microsoft will have to make some very tough decisions moving forward if it wants to help reinvigorate the PC market. I have to point out that Q1 PC shipments are far worse than those I had projected in my substitution rate based estimate. Since that estimate was based on the substitution rate we saw in the early days of the legacy vs. modern smartphone battle, there was no way to incorporate the destructive potential of a "Windows 8" (would probably need to be updated once other Q1 figures are announced). Ironically, the closest equivalent in the collapse of legacy smartphones was Nokia's transition from Symbian to Windows Phone, but even that had a milder impact compared to the "Windows 8 effect".